With enormous enthusiasm and unsinkable optimism, daredevil Gonzo steps into his first starring role in Jim Henson Pictures' "Muppets From Space,'' it was announced today by Columbia Pictures, which is financing and distributing the film. 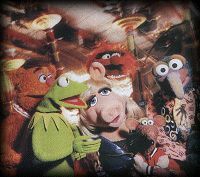 Joining Gonzo in the film, which began principal photography on November 9 in Wilmington, NC, are Kermit the Frog, Miss Piggy, Rizzo the Rat, Fozzie Bear, Animal, Dr. Teeth and the Electric Mayhem Band and many of the other beloved classic Muppet characters. Also starring is Jeffrey Tambor ("Meet Joe Black,'' "There's Something About Mary,'' "Dr. Dolittle''). Featured in cameo roles are David Arquette ("The Alarmist,'' the upcoming "Never Been Kissed'' and "Ravenous''), Pat Hingle ("A Thousand Acres,'' "Batman & Robin,'' "Batman''), Ray Liotta ("The Rat Pack,'' "Copland,'' "Goodfellas'') and Andie MacDowell ("Four Weddings and a Funeral,'' the upcoming "Town & Country'' and "The Muse''). "Muppets From Space'' is directed by Timothy Hill, making his feature film directorial debut from a screenplay by Jerry Juhl and Joseph Mazzarino. The film, from Jim Henson Pictures, is produced by Brian Henson and Martin G. Baker and executive produced by Kristine Belson and Stephanie Allain. Co-producers are Timothy M. Bourne and Alex Rockwell. The Muppets are back in the zany comedy "Muppets From Space,'' a hilarious extraterrestrial adventure about the search for Gonzo's past. On a quest with buddy Rizzo to find his real family, Gonzo discovers that his long-lost relatives are actually aliens from a distant planet. After announcing to the world on Miss Piggy's talk show, "UFOMania,'' that he is living proof that "we are not alone in the universe,'' Gonzo becomes the target of paranoid government operative K. Edgar Singer (Jeffrey Tambor). In the end, Gonzo must not only escape the Singer compound, but decide to either board the mother ship and join the family that he has always wanted, or stay on Earth with the friends that he has always known and loved. Jim Henson Pictures was formed in 1995 by The Jim Henson Company and Sony Pictures Entertainment to develop and produce unique feature films for audiences of all ages. The Jim Henson Company, an established leader in family entertainment for more than 40 years, is an independent multimedia production company; it is one of the top licensors in the industry, a leading publisher of children's books, and home to Jim Henson Television and Jim Henson's Creature Shop. The Jim Henson Company is headquartered in Los Angeles with offices and production facilities in New York and London. The Jim Henson Company's web site is located at www.henson.com. Columbia Pictures, part of the Columbia TriStar Motion Picture Group, is a Sony Pictures Entertainment company. Sony Pictures' global operations encompass motion picture production and distribution, television programming and syndication, home video acquisition and distribution, operation of studio facilities, development of new entertainment products, services, and technologies, and distribution of filmed entertainment in 67 countries. Sony Pictures Entertainment can be found on the World Wide Web at http://www.spe.sony.com.